The truly compact A4 desktop scanner fi-6140z scans 60 sheets per minute at 200 dpi resolution or 40 sheets per minute at 300dpi, in simplex or duplex, monochrome, greyscale, or colour. The optical resolution is 600 dpi and the colour depth is 24 bits. 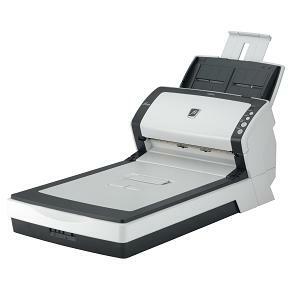 The automatic document feeder capacity is 50 sheets (80 g/sqm) and it handles documents weighing up to 210 g/sqm as well as embossed plastic cards, i.e. credit cards, social insurance cards, etc. The background is selectable white or black and documents up to 3048 mm long may be scanned. Ultrasonic multi-page detection prevents that two or more sheets are scanned simultaneously, ensuring that the front and back images originate from the same sheet. An optional post imprinter prints up to 40 user defined characters while scanning the document for endorsing/archiving purposes. The fi-6140 comes bundled with VRS Professional, the leading industry standard for image enhancement. Combined with the built in auto-colour recognition, auto-size recognition and auto-de-skew functions the result is excellent image output quality and improved production efficiency. USB 2.0 and Ultra SCSI interfaces guarantee simple connection to any common system. 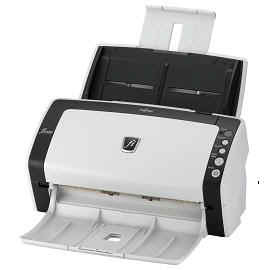 The fi-6140 is ideal for all applications where up to 4000 documents per day will be scanned. 41 to 210 g/m2 ; for A8 sheets supports 127 to 210 g/m2. Card feedability (ADF) supports both portrait and landscape feedability 1.4mm thickness or less. SCSI interface cannot be used simultaneously with USB2.0. The compact Fujitsu fi-6240z A4 desktop scanner offers all the features of the fi-6140 (except the imprinter option) together with an A4 flatbed.